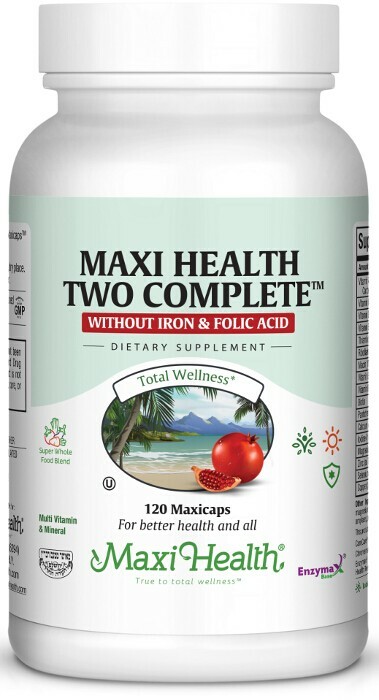 Maxi Health Two Complete™ Without Iron is our well balanced, just 2 a day multi-vitamin. We combined essential vitamins and minerals, in a synergistic blend, to support your health and help you get through the day. In addition to all the critical vitamins and minerals you'd expect from us (see Supplement Facts tab), feast your eyes on our proprietary super-food blend of antioxidants and amino acids containing; l-taurine, lutien, Pomegranate 40p™, green tea extract, cinnamon extract, pycnogenol, Acai powder and lacotobacillus acidophilus! Get yourself and your family on board with proper supplementation. For a formula that works, get Maxi Health Two Complete™ Without Iron. Other Ingredients: Vegetable cellulose, microcrystalline cellulose, vegetable magnesium stearate, Enzymax® (calcium carbonate, bromelain, papain, lipase, amylase, protease, silica). This product contains no wheat, soy, salt, milk, yeast, gluten, fish, artificial flavors or colorings. CaroCare® is a registered trademark of DSM Food Specialties • Chromemate® is a registered trademark of InterHealth Nutritionals, Inc. • Enzymax®, a vital digestive enzyme complex, is a registered trademark of Maxi Health Research® LLC. • Biolut™ is a trademark of Biolut SA de CV. • Cinnulin PF™ is a trademark of Integrity Nutraceuticals International • Pomegranate 40p™ is a trademark of PL Thomas & Co., Inc. • Pycnogenol® is a registered trademark of Horphag Research Ltd. • Selenium SeLECT® is a registered trademark of Sabinsa • Suntheanine® is a registered trademark of Taiyo International Inc. • TRAACS® is a registered trademark of Albion Laboratories, Inc.